My wife and I used to do devotions on a daily basis, and while we still talk about God a lot, pretty much all day, we haven’t had the discipline of a daily devotion together for awhile now. While searching for a devotional to do together, I came across Mornings With Jesus. Guideposts was gracious enough to send me a copy through Litfuse, and I just finished going through it to see if it would be a good fit for us. My overall review is that it’s a pretty good devotional. It’s not deep theologically, but it is deep relationally in terms of our relationship with Christ, which is eternally more important. Jesus is perfect theology, so if you want to know great theology, you have to know Him right? It’s also written by and geared toward women more then men, but I think it will do just fine for a devotional for a couple as well. Part of being the spiritual leader of a household, fellas, is having some empathy for our wives. Since then, we’ve gone through a few books together, and we’ll probably go through Mornings with Jesus as our devotional. See what other bloggers are saying at Litfuse. "Be still and know that I am God” is one of the most beautiful verses from the Bible, but it’s not easy to practice in this busy world. Mornings with Jesus will help you do just that, be still in Jesus’ beautiful and powerful presence. For those who are seeking a deeper experience in their relationship with Christ, Mornings with Jesus offers a fresh perspective of who Jesus is (the Healer, the Son of God, the Comforter, the Good Shepherd) and what that means for day-to-day life. 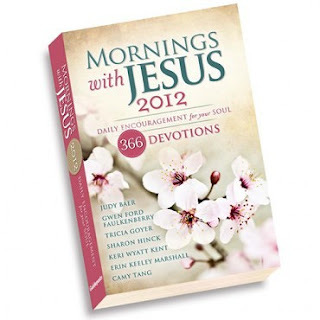 With a warm and friendly voice, 365 short devotional writings on the character and teachings of Jesus encourage readers to greet each day by drawing near to Him and inviting His presence into their day. Spend time with Jesus at the beginning of each day and experience His nearness and peace in a new way throughout the year. Each day’s selection includes: a Bible verse; an entry based on Jesus: His words, miracles, and parables; His wisdom, compassion, and comfort; His mystery, power, divinity, and humanity; and a faith step that will inspire and challenge readers to apply the day’s message to their lives. Very nice review! I love what your wife said! Thanks for this- it gave me a smile and info on a devo that caught my eye. I miss the family devotions our family used to share. Thx for sharing this. I used to read Guideposts growing up and in my earlier years. I've read some of the yearly devotionals, and you just might enjoy it.